Comfortable and easy to wear swim suits with front and back inflatable chambers. Inflatable buoyancy suit positions child upright in the water. Swimsuits equipped with a 45 SPF rating, blocking 96% of UVA & UVB light rays. 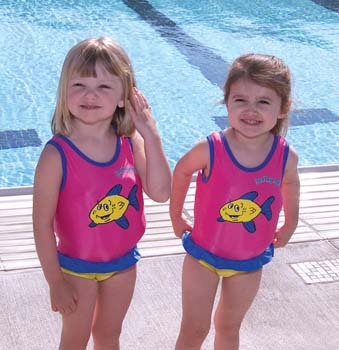 Manufactured with a durable 100% polyester, chlorine resistant material. Recommended for children 3-6 years old in 2nd year of swim lessons. MEDIUM: 4-5 YEARS, 45-60 lbs.LARGE: 5-6 YEARS, 45-60 lbs. Constructed with multible air chambers for added security, comfort and stability to achieve residual buoyancy. Reinforced safety handles keep child close to parent. Unique seat design provides added comfort and support. Heavy gauge PVC material equipped with custom one-way air valves. Infants 6 to 24 months old, maximum weight capacity of 33 lbs. THIS IS A SPECIAL PRICE FOR A LIMITED TIME!! !